During a seminar, Paul and Richard give demonstrations of how to use NLP on specific issues. Once they have done that, they ask the delegates to practice the technique with each other. As an assistant, it is my job to help delegates in following the exercises correctly. Assistants help the seminar to run smoothly supporting the trainers in doing a good job, thus giving the delegates value for money in being able to learn more easily and fully. I have been assisting on and off now for over 10 years and I always learn something new for which I am truly grateful. 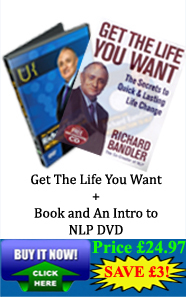 I was very privileged to have been granted an interview with Richard Bandler who shared his thoughts on NLP and healing. Read the full Richard Bandler interview on healing here. Become and NLP Practitioner during 11th - 17th May 2013. If you are already a Practitioner of NLP, become a Master Practitioner during 5th - 13th October 2013.